Alliance alts, Horde alts, DK alts (it’s a very large subset of my alts, I must admit), all leveling on different servers, with varying amounts of gold. And at first I did this the old fashioned way. You know, by questing. Hoping that someone on the server might be brave enough to form a team, and after a few hours of doing that, actually run a dungeon or two. But most of the time, it was questing (and killing, as many quests involve killing things). It was hard for me, as I am not the best at killing things (“I’m a heala, mon, not a killa”), especially when I spec half of my toons into healing specs, and expect them to kill things (guess what – they don’t). Overall, a painful process, when one is playing by one’s self. But then the Looking For Dungeon tool came around. Gone were the days of waiting for hours for a dungeon run. Hit the random and off you go, to those oft-forgotten dungeons of yore (that I forgot were so long, in quite a few cases). 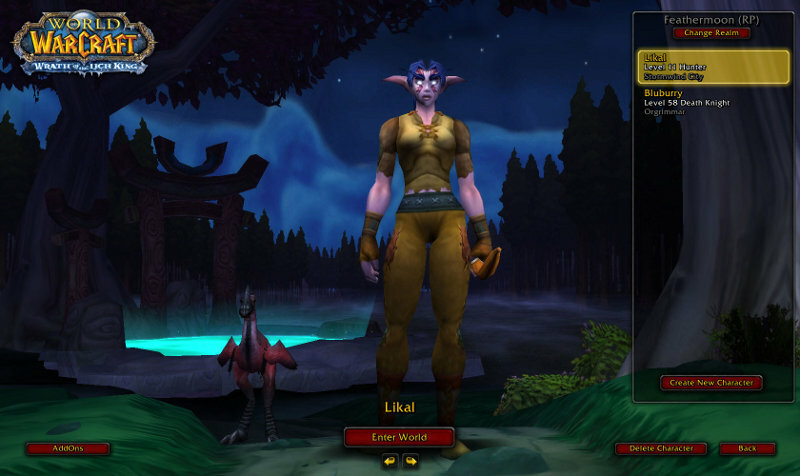 Many of my toons began to level with LFD almost exclusively; it was easy enough to pop on and hit the button, whirl about a dungeon for a bit, and then go back to whatever I was doing before (which is mainly avoiding doing housework or wedding planning, or attempting to stay up later than I should). But while the LFD system was (and still is) decidedly fun, there was still something missing… something I realized when I read Pugging Pally. Yes, Vidyala had epitomized what should be done with the the LFD system – level a toon all the way to 80 only in dungeons. And I agreed with myself that having a blog would be a good idea, and then I filed the idea under “Things I Probably Should Try Doing” in my brain and left it alone for a few months. It probably would have stayed there, too, had SAN not started up. Because in those early days of SAN, there was a lot of conversation in guild chat. And all of those bloggers talking and discussing really made me want to start up my own blog. And you know what? I did start my own blog! You’re reading it right now. And with the starting of the blog, the Pugging Pally idea moved up to the “Yeah, You Should Do This Sometime Maybe” file in my brain. But first there had to be preparations! The first step was deciding if I was going to put the Pugging Pally posts in a separate blog or in this blog. I thought it would be a little too derivative if I made it into a separate blog, especially when I had a nice blog just sitting around here, twiddling its thumbs and wondering when I was going to post in it. 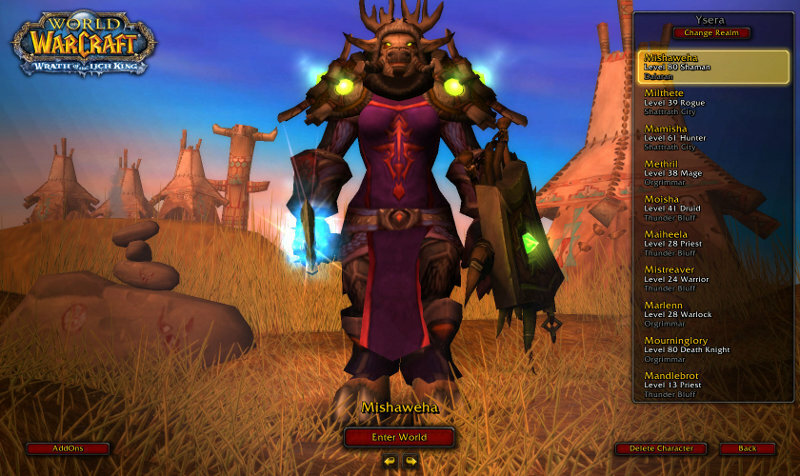 Secondly, I had to decide what race this Paladin would be, and on what server it would live. Fortunately, I always had a hidden desire to make a male draenei paladin (seems like a fairly normal gender/race/class pairing, but sometimes you just have to have the little guilty pleasure of making one of those). And the server was easy enough to pick – SAN had recently started up, so whatever better place to roll a little alliance toon that I was going to blog about than on Argent Dawn. And so Mishalom, the manly Draenei Paladin, was born. Who then had to level the ‘boring way’ up to 15, as you can’t do Random Dungeons until then. But as I leveled him, I considered what the rules for my version of Vidyala’ Pugging Pally would be. You may find the ‘final’ draft below. Thou shalt record a statement saying that thou art using the idea from the Pugging Pally blog in thine future posts, that hath the qualities of the following statement: Mishalom, Pally of the Pugs, is trying to get to the WoW level cap using only the LFD tool in WoW! This idea is based off of the original Pugging Pally, Vidyala! The general gist of the rules, as you ‘hast’ read, is that I want to level solely as a paladin healer, and only while in dungeons. I know that Vidyala started as a healer, but occasionally dipped into dps (and tanking, I think) roles. Since the queue times are different depending on your role, I thought I’d just stick with one, to see how it goes (future project ideas include leveling solely as a tank or dps). In addition, Vidyala broke down and went questing at least once during her trip to 80 (I think that was because the dungeons were getting pretty slow in between, and she wanted to quickly level her alt to 80 so she could do end-game things), and I want to avoid doing that and keep Mishalom leveling strictly with dungeon experience only (so no dungeon quests either!). Since he’s on a server where I don’t participate in end-game (yet), I don’t think I’ll be too impatient to level him. 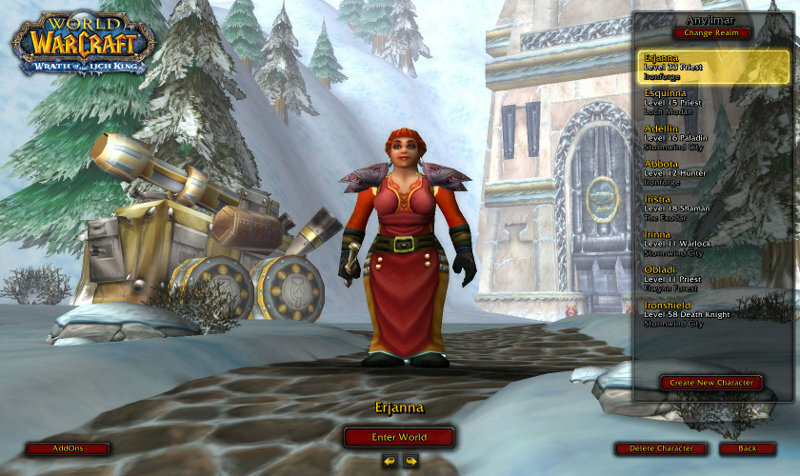 And since I have tons of alts, I can just switch to a different one if I feel like questing, or just not doing dungeons. Note: I was originally going to not allow for me to do any more quests once I was past 15, but level 15 is when paladins get the questline to learn how to rez folks, which I thought was rather important. I decided to give myself a little leeway when it came to class quests. Now, I was originally going to show off Mishalom right here, right now, but then I decided to do a time honored blogging tradition, which is, to say, stretching out your ideas upon as many different posts as possible. Therefore, in my next installment of Pally of the Pugs, you’ll meet the man himself, Mishalom, and get to know a little bit about him and his stats. (Plus I expect the nest post to be a little image heavy, and adding images always complicates things). ** The SA would argue that I have out-of-game ADD too, but I don’t think that’s – Ooo, shiny! ***Actually, I already started “The Pally of the Pugs” Project, but I just haven’t blogged about it yet. So I already know I broke one of these rules, since I’m writing the rules after starting the project! You’ll have to wait to see which one, but I think it’s one of the least important ones, so I’m only feel slightly guilty for breaking it. EDIT: Please note that this project has had a name change due to a friend of Vidyala pointing out that the name (of the project) was too close to Vidyala’s blog name, which could lead to confusion, something I had not considered before. (See the comments below for more details). This is my first blog. I would think that would be obvious by now, dear non-existent reader. I mean, just look at the place; sparse yet eye-bleeding design, only two posts to my name, a lack of widgets and links on the sidebar, with barren pages roaming the site. Seems pretty typical of a blogger starting out, right? And why, you may ask, do new bloggers not bother to begin with these things, even with posts telling them exactly how to start out? Do they like avoid advice? No! But in order to get posting, one must first post, and then worry about the details like making the blog pretty later. I read tons and tons of blogs. In fact, I’m still doing this, though not as much now since I’m only reading them at home in my spare time (aka when I’m not playing WoW). And doubly in fact, I didn’t even read them in order to start blogging; I read them because they were interesting. But, it certainly helps you to think ‘I could do that too!’, now doesn’t it? I researched where I wanted to put my blog. As you can tell, I decided on WordPress, because it has lots of shiny tools… and I didn’t really want to make yet another google account to log in and out of if I used Blogger (I’m still grumpy at them for adding everyone to Buzz automatically). I joined Single Abstract Noun, or SAN, the blogging guild on Argent Dawn (US). It’s Alliance, ’cause they couldn’t be awesome like the EU chapter that is Horde on their Argent Dawn server. Talking to everyone there and how quite a few of them had blogs was very neat, and really made me want to start a blog even more than reading blogs. Funny how that works, huh? I actually made the blog. That’s an important step in blogging, or so I’ve heard. That means I finally made my WordPress account, spent hours and hours picking and repicking themes, messing with those themes settings, adding and subtracting widgets, adding and subtracting pages, and generally making a mess of the internet. So after all of that… I posted my very first post. But after that – which surprised me – there was a lag time for my posts. I started writing posts that would not be suitable to be my first post. And when I started to write the first post, I became… distracted with other things, causing me to write more unrelated posts. It seems that I have 8+ drafts at all times (though, really, I haven’t been doing this all that long, so we’ll see how my draft bucket is like later); although, most are incomplete, with just a post title or a few notes in a list format. But what really adds to the lag time is the fact that I don’t seem to finish a post in one writing session! What I think would be a short post (such as this one), grows into a much larger beast, one that I can’t finish writing in one day. So I write a bit the next day, and then another bit the next day, which in the end leads to a disjointed mess (yes, more than it is already) that needs to be rephrased and rewritten. And the editing phase takes much longer than I think it should. But that’s why you never see any mistakes*. Sorry for this mini-rant about blogging. I’m a little surprised about how different my initial experience is than I thought it would be. The posting rate? Slower (I now gaze upon daily blog with envy). The number of ideas? More than I thought, if the number of draft posts I have indicate ideas (that may not be true). Are they interesting ideas? Well… maybe not as interesting for you as they are for me. Hopefully that will improve with time and experience (but for who!? We will never know). And with all these revelations about blogging stated, I have one more to add: You should read this blog in an RSS feed instead of coming to the site. Why? Because the site is still ugly, and I don’t think I can post much more often than once a week, meaning a feed is the best way to keep track of when there are new posts without visiting the site each day and then seeing no content, yet again (not that I’ve ever had an experience like that). That was a surprise conclusion, wasn’t it? Glad you thought so too. * Disclaimer: There will always be mistakes.